Most parents have to nudge a "thank-you" from their child after he receives a present. Etiquette isn't something kids are born with, so it's understandable that parents must instill good manners into their routines. A thank-you note is a must after a holiday or birthday gift, but the same old note isn't all that much fun for kids. Making gratitude something your child thinks about is easy when it becomes something exciting and fun. Try these creative ways to express thanks and your child will be well on his way. Say your parents send your child a new toy. A quickly scribbled note lets them know you remembered to say "thank-you," but it doesn't necessarily display your child's gratitude. Instead of forcing your child to write a note she doesn't want to, try an email slideshow. With a bit of parental assistance, even a toddler or preschooler can make this type of thank-you. Take several photos of your child using the gift, whether that happens to be playing with a toy, wearing a new outfit or reading a book. Try some silly shots and some serious ones. Download the photos to your computer. Assemble the photos into a slideshow using Microsoft video or a similar program. Simply click the photos you want, and then mix and match the available backgrounds and icons to create a custom slideshow. Get your child in on this step so that he's part of the process. Send the email as an attachment to the gift giver. This type of thank-you message is fun because it allows the person who sent the gift to see your child enjoying it. This method is especially great for out-of-town relatives who may not see your child frequently. As long as you have a cell phone, you can create a video to text instead of a paper and pen type of note. Kids with their own cell phones can even do this by themselves as long as they have a place to set the phone during taping. It's easy with the following step by step directions. Access the camera feature on the phone. Choose the video mode, and tap to activate it. Hold the phone or set it on a tripod or sturdy desk to keep it from shaking around or falling during taping. Have your child stand so that his face and body are clearly visible on the screen. Press the red record button and have your child say "thank-you," sing a song or proclaim excitement about the gift. Press the record button again to stop the video. Click "share," and type in the phone number or name of the person you're texting the message to. Send the message, and you're done. This unique way of saying thanks gets your child actively involved and the response of the receiver is sure to get your child motivated to show gratitude more often. If your child receives a gift in the mail, you can video text your child opening the gift too. That way the gift giver can see the true gratitude on his face. If you can't text videos, try uploading them to the gift givers social networking site instead. Spoon frosting tinted with your child's choice of color into a piping bag fitted with a writing tip. Let your child write "thank-you" on the cookies. Parents can help kids who need a bit of assistance spelling or guiding the frosting. Package the cookies, and deliver to the gift giver with a smile. 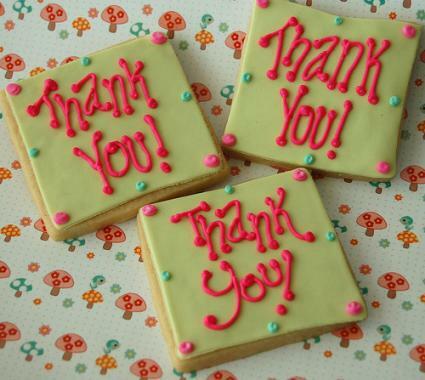 Cookies are idea for this type of thank-you, but let your child's imagination roam. Brownies, homemade fortune cookies with a handwritten "thank-you" inside or a cupcake with a flag attached to a toothpick for a note are other easy variations. A candy bar with a note wrapped around it is an easy alternative that younger children can do. After all, who doesn't love a picture or note created by a small child, especially when accompanied by dessert? This type of thank-you note is perfect for kids who want to show gratitude to friends after a birthday party. It's fun for your child as he creates the note, but it's also fun for the receiver of the note as he attempts to assemble the pieces to find the message. Use these simple steps to make your puzzle. Have your child draw a picture on a piece of cardboard or card stock, or write a thank you message. Help your child cut the note into several pieces and place them in a plastic bag. Give the note to the gift giver, and challenge him to put it together. Kids are sure to love this idea, but your child can also send puzzle thank-you notes to family members. 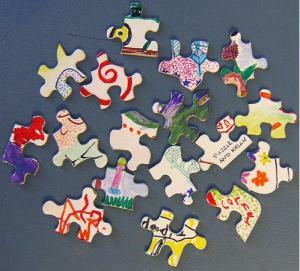 You can also modify this idea by cutting a photograph into puzzle pieces. Once it's put together, the gift giver gets to see your child using the gift with a big smile. 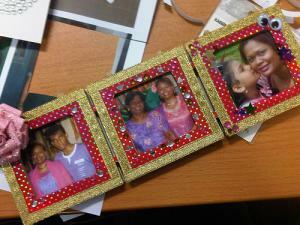 Give your child a cardboard or foam picture frame, which you can get at any craft or fabric store. Have your preschooler decorate the frame with paints, glitter, stickers, markers or crayons. Give her a photo of herself with the gift and show her where to insert it, letting her do most of the work. This is a great craft for preschoolers because they can enjoy it, but it doesn't take so long that they lose interest in the project. It's also a great way to get their imagination going and give them free rein over their version of "thank-you." When your child writes or creates a thank-you note, there are a couple of aspects never to leave out. Make sure she acknowledges the person who gave the gift. She should say thank-you specifically for the item, then mention something she loves about it. "Thanks Grandma for the new slippers. They're really warm," is an easy example that even younger kids can master. This way the gift giver knows your child is expressing gratitude to him and not simply reciting a script that will be sent in mass to everyone. Gratitude isn't an inborn trait, but helping your child create fun thank-you notes will give your child the tools to express it on his own eventually.